Tasting Australia's influence flows far from its epicentre in Victoria Square. Here are a few good reasons to take a road trip out of the city. While a great amount of attention is heaped on chefs during Tasting Australia, the producers and regions further afield also make the most of their share of the limelight throughout the festival’s 10 days. There is only so much travel one can do in that amount of time, so in order to help you triage your road trips, CityMag has collated a handful of our favourite events and ordered them below from least t0 most expensive. Grab a ticket and experience South Australia as Mother Nature intended – with a good amount of food and wine. CityMag has been singing from the Kuitpo songbook as early as 2016, when we met James Hamilton of Golden Child. We visited again last year when Freddy Nerks set up within a stone’s throw of K1 by Geoff Hardy, and, to be honest, it’s time we visited again. In its inaugural event, the Kuitpo Kollective will see 15 producers from the burgeoning Adelaide Hills subregion come together and offer tastings and chit chat about their more than 50 wines on show. The producers in attendance are Fox Gordon, Golden Child, Jericho, XO Wine Co, Chain of Ponds, K1 by Geoff Hardy, Living Roots, Smidge Wines, Top Notes, Sew & Sew, Mr. Riggs, Coates, Lazy Ballerina, Hersey and Tregarthen, and among their wines are the locale’s emerging varieties, such as fiano, fumé blanc, gruner veltliner and gamay. The event will also see Osteria Oggi, Udaberri and Sunny’s Pizza all extend their reach out to the Hills, offering a proper pairing to the great wines on offer. Katie Spain will host a panel of winemakers, talking about the idiosyncrasies of the region, the alternative varietals and styles being produced, and the emerging and established brands. And as if that weren’t enough, DJ Surahn (an Adelaide Hills producer himself) will be providing tunes throughout the day. For a blissful few weeks, it was just a short walk across the CBD to get a fix of Pizzateca’s wood-fired wares at Sugateca, but having receded back to their home base in McLaren Vale, the Mitolo family is again luring us south. The draw of Pizzateca’s titular product – their renowned pizzas, from the fiery Diablo to their humble margherita – is inarguable, but there’s another side to the eatery that we’re yet to experience. Everything but the Pizza is a sharp left turn in offering from Pizzateca, and one that forgoes the slices and will instead showcase the Mitolo’s Abruzzese heritage, with a familial five-course lunch. As is customary for the Pizzateca crew, every dish will be crafted from scratch and with care (‘all hands, no cans’ is the motto underlying their sugo) and paired with Tony and his father Vito Mitolo‘s V Mitolo & Son wines – only ever available at Pizzateca’s McLaren Vale HQ (except on very special occasions). Since leaving Orana and Bistro Blackwood about a year ago, roaming chef Shannon Fleming of Forgotten Seasons has made his name promoting his native Forest Range and its produce by plating it up with great respect to the land and the producers who’ve made it happen. 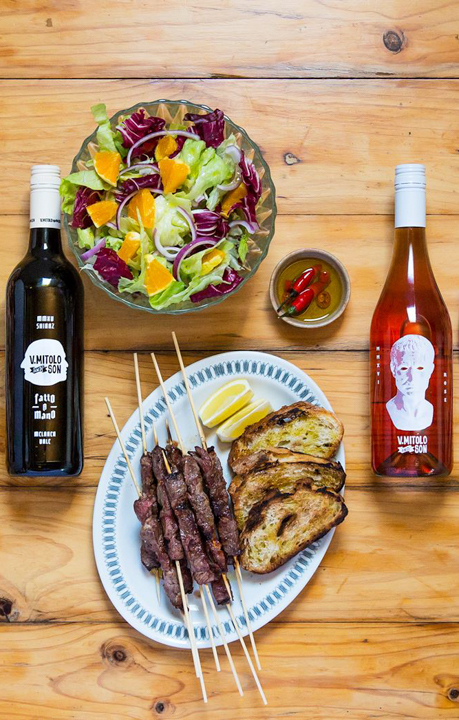 In Cider Fromage Orchard harvest Rendezvous, Shannon is teaming up with Adelaide Hills cider producers LOBO to celebrate this year’s Pink Lady harvest. The lunch will be paired with LOBO’s wares and will also feature cider-washed cheeses from Section 28. The Subterranean Supper Club as a concept began almost as soon as Abby Osborne and Julian Velasquez founded their South American-influenced Greenock eatery, El Estanco, but only in the last couple of years have they formalised it by giving it a name. The couple found like minds in a few local winemakers and decided to invite the public into their world for a night, to meet the producers and get to know some of the new faces shaking up preconceived notions of what a Barossa producer is – all the while feasting on the fare Abby and Julian cook up in a nearby fire pit. “People are loving that they’re seeing the small, unusual misfits coming out of the Barossa,” Abby says. Along with great wine from The Mysterious Mr Black, Geyer Wine Co and Arno Wine Co., the 2019 edition of Subterranean Supper Club will be the first time Abby and Julian will prepare a paddock-to-plate meal from their Eden Hill farm. “We’re so lucky to be in this position… we’ve raised the cow, butchered the cow, and so we’re in the whole process from paddock to plate, from start to finish,” Abby says. “We’ve done pigs, lamb, cows, we’ll start to do more vegetables and that sort of stuff, we’ve got a fig tree up there. It’s amazing. You just have a [different] relationship. I know this cow is going to have the best possible life it’s going to have, and we treat it with utter respect, and… the food miles are zero, we know it’s had an amazing life, it just brings another level to the dinner. For Subterranean Supper Club to be included in the Tasting Australia lineup was a meaningful achievement for Abby. “When we made Tasting Australia, I felt like we made it a little bit. It’s like ‘Oh my god,’” She says. Tickets are almost gone for Subterranean Supper Club, so get in quick and purchase at the link. Billed as the “antithesis of the supermarket experience,” Wild Adelaide will see a group of adventurous foragers led by Conscious Lifestyle‘s Tiffany Schultz, who will employ her background in ecology and natural resource management to demonstrate how we can make the most of the wild, urban, peri-urban and rural areas that surround us to our benefit. But it’s not just for the pursuit a richer and more diverse pantry, Tiffany says. “Learning to observe the landscape and season, is an eye opening experience. Part of the journey is rediscovering our natural instincts and innate abilities for connecting with nature and the foods that are most beneficial to us. Connecting with nature also makes us feel good,” she says. The adventurous ticket-holding troupe will take off from the Adelaide CBD into Peramangk country, led by Tiffany and Tamaru Kartinyeri of Deadly Mob, where they will forage and consume the equivalent of a four-to-five-course grazing meal, plus a glass of wine and wine tastings and other beverages along the way, returning back to the city at 4:30pm.